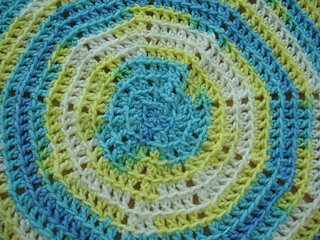 This blanket is so easy that you will make it again and again. Made in sport weight yarn with a size J (6 mm) crochet hook, the design is worked in the back loop in a continuous spiral with no joined rounds. 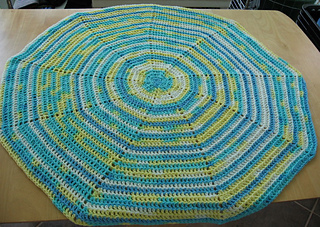 Finished size about 33” across. 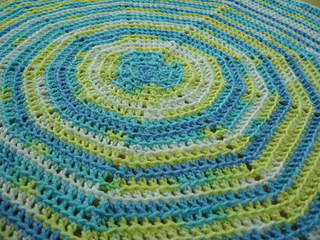 This method creates a ridge that spirals like a snail shell around the blanket. 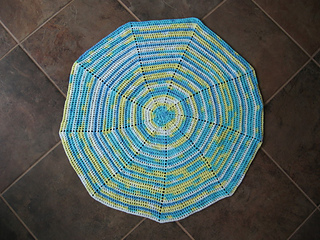 Use one color, a yarn with long color runs, or work it in bands of different colors. The 4 page pattern contains written instructions, a crochet chart, and two tutorials. Substitute any weight of yarn by choosing a hook larger than usual. For example, in worsted weight about 600 yards of yarn and a size K (6.5 mm) hook will produce the same size blanket. Make it as large or small as you like.